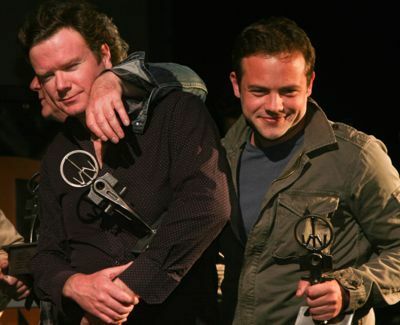 The 15th annual Woodstock Film Festival wrapped Sunday and an Irish film, Patrick's Day, about a love affair between a heavily medicated schizophrenic and a suicidal flight attendant, won a trio of top awards: best narrative feature, best cinematography and best narrative feature editing. The film's handsome and irreverent director Terry McMahon charmed the audience at Sunday night's Maverick Awards with tragi-comic tales of his struggles to make the film, which left him broke and with his house in foreclosure. Mental health challenges, suicide, gender identity, sexual abuse, adultery and world politics were some of the themes explored in both documentary and narrative film during the five day festival. Indie icon Mark Duplass came with Creep -- which he co-wrote, co-produced and acted in -- about a dying man who finds someone on Craigslist to document his final days. 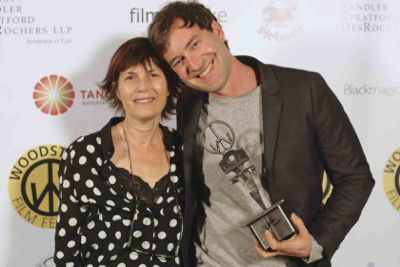 Duplass won the festival's first Fiercely Independent Award and, in his acceptance speech, gave some good advice to both young filmmakers and established producers alike. He counseled those starting out in their careers to be kind and not arrogant to studio bosses and producers giving them notes and suggested that producers "write a check for $25,000" if they came across a young filmmaker whose work they admired. "Then when you are in a bidding war at Sundance for his next film, he'll remember the gesture," Duplass said. "Let's raise each other up," he added. Even perky Courteney Cox Cox explored suicide and bullying in her feature directorial debut, Just Before I Go, which she said she mostly financed with her own money. Despite the subject matter, the film was one of the funniest in the festival; Cox obviously learned a lot from the comic masters who created Friends all those years ago. 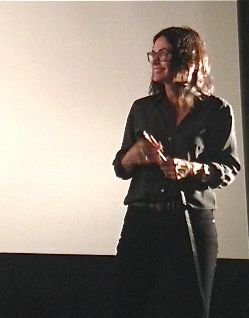 Cox attended the festival and was part of a panel of women filmmakers, that also included Academy Award-nominated Winter's Bone director Debra Granik. Another suicide-themed film, Before I Disappear, was Shawn Christensen's masterful expanded version of his Academy Award-winning short about a guy whose suicide attempt is interrupted when his estranged sister asks him to watch her young daughter for a few hours. Christensen wrote, directed and starred in the film. The festival showcased 22 world premieres, one of which, East Jerusalem/West Jerusalem, kicked off the festival. The music doc follows the creation of Israeli superstar musician David Broza's last album, a joyful collaboration between Palestinian and Israeli musicians produced by legendary singer/songwriter Steve Earle (who had a guest starring role in The Wire) in a tiny studio in Palestinian-controlled East Jerusalem. 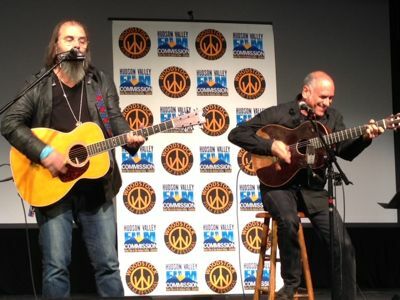 After the premiere, Earle and Broza played an acoustic set that included Earle's heart-rending ballad Jerusalem, which he wrote before he ever stepped foot in that part of the world. Whenever possible the festival showcases local films like Lacey Schwartz's documentary Little White Lie, about a young local girl who was brought up in a white Jewish family where no one mentioned the fact that she clearly had African American blood, and Passing Ellenville, a short character study of two transgender kids growing up in a nearby Catskill mountain town. Other crowd pleasers included Wildlike, a sad and sordid tale of sexual abuse against a pristine Alaskan background; Matt Livadary's Queens and Cowboys: A Straight Year on the Gay Rodeo, which busts open the macho cowboy stereotype; Arwad, a beautifully shot tragic love triangle filmed on a remote Syrian island, and Audience Award-winners, Sean Mullin's Amira & Sam (narrative) about a romance between an Army vet and an Iraqi immigrant faced with deportation, and Thomas Miller's Limited Partnership (documentary), which follows a gay couple's 40-year relationship and their struggles with the immigration system. 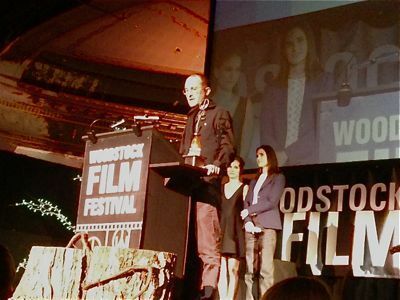 The Woodstock Film Festival is small enough that journalists and fans can easily mingle with their favorite actors and filmmakers, and celebrities do indeed turn out; this year Natalie Portman and Jennifer Connelly showed up to present director Darren Aronofky with the Maverick Award. Co-founded by Israeli-born Meira Blaustein and French-born Laurent Rejto, the event has grown into something more than a pretext for a fall leaf-viewing weekend away from New York City. That said, spending a few fall days upstate New York, with the leaves blazing every color from gold to red, is balm for the soul. Woodstock is one of the magical places I always long to return to with its winding country lanes; mom and pop shops; Barbara Boris's Woodstock Yoga Center; organic fruit and vegetable stands; and the iconic Bear Cafe, started decades ago by Bob Dylan's manager Albert Grossman and -- believe it or not -- still going strong. Even Vogue did a feature about the town last month that has real estate agents already raising prices on properties. Each time I am there, I uncover other little gems; this year it was Babs Moley's River Rock Health Spa. One afternoon I had one of the best massages ever by Gillian Cilibrasi, who co-founded the place with Babs, and who now runs Donna Karan's Urban Zen Integrative Therapy program. After the massage and relaxing in the individual steam shower, I was again ready to sit through movie after movie. Another "little gem" discovery came with me from Los Angeles to Woodstock: my Lily & Lola shoulder bag, which I will carry to every event I cover. Lightweight though leather with pockets galore, in beautiful gun metal grey, this is now my favorite accessory; it allows me to schlep all my stuff while looking chic and trendy. Plus it's made in the U.S.A.